When traveling abroad, everything you know about how to perform daily activities can suddenly be turned upside down. Even something as simple as how you go to the bathroom can completely change the instant you arrive on foreign soil. To help ease the culture shock, I have put together a list of everything you need to know about how to use a toilet in South Korea. One of my favorite things about Korea is how easy it is to find a clean public toilet. They are almost everywhere, and if all else fails, you can usually use the toilet at any major coffee shop or fast food restaurant. If you can’t find a toilet, here’s how to ask for the bathroom in Korean: Hwa-jahng-shil-ee uh-dee-eh-yo? 화장실이 어디에요? You can’t spend a day walking around Korea without seeing someone in the squatting position, whether they are selling fruit in a market or just resting. Koreans are pretty amazing at squatting! They do it beautifully, on flat feet and with perfect balance. If the position is that natural to you, why not squat? Plus, you don’t have to sit on a dirty toilet seat! And most importantly, the squatting position is much better for your body during bowel movements (here’s more info about that). Personally, I am terrible at squatting and choose to only use the squat toilets when I absolutely have no other option. I know a lot of other westerners that feel the same way. Oh and a tip about the bidets: The buttons are not in English so be careful when pushing them. Typically, the bidets are just normal toilets with a fancy seat so they usually flush the same way (so the handle may be behind the seat lid). Don’t make the mistake of trying to push random buttons while standing thinking it’s going to make the toilet flush. This is one mistake I’m thankful I’ve never made, but I have seen the wet aftermath a few times. Women, watch out for the urinals! Some bathrooms in Korea are unisex. If you are a woman and walk into a bathroom that has a urinal and toilet stalls, it’s perfectly acceptable to lock the main door behind you. There’s nothing more awkward than coming out of the stall, rounding the corner expecting to wash your hands only to realize there’s a man doing his business right in front of you. Hate to say that I’ve learned this from experience. Twice. It’s a good idea to always carry some tissues with you. Sometimes the toilet paper dispensers are located outside of the stalls or toilet paper may not be provided at all. If there’s a community toilet for many different businesses, each business will usually provide the toilet paper so you’ll have to grab it before you go in. Yep, I have seen a toilet paper dispenser on the wall of a coffee shop. If you do find yourself in a situation where you are in desperate need of a good samaritan to help bring you some TP, try saying “Huge-ee jome joo-say-oh” (휴지 좀 주세요). DO NOT flush the toilet paper! Right now you’re probably wondering what the hell you’re meant to do with your used toilet paper… right? Every toilet stall in Korea will come equipped with a trash bin that is meant to hold all of your soiled tissue. This is probably the most difficult thing for westerners to wrap their head around. The problem is, the pipes just weren’t designed to hold all of the toilet paper and can easily become clogged. Almost every public bathroom has a sign taped to the door that asks you politely not to flush the paper. Whether or not you flush at home is up to you, but know that most buildings will make you foot the bill if your tissue clogs the pipes. You should definitely factor the age of your building in when making your decision. What’s up with the soap on a stick? One of the things that shocked me on my first week in Korea was an encounter with a soap on a stick contraption in a public bathroom. I’ve grown used to liquid soap so it bewildered me so see so many bathrooms that just have bars of soap for everyone to share. The longer I’ve lived in Korea, the more I adapt to the Korean way of life, but it’s definitely a strange sight at first! Primping is a huge thing in Korea, among men and women. In fact, many bathrooms purposely have a separate mirrored area so that the primpers don’t get in the way of those wanting to wash their hands. Oh, and some toilet stalls even have mirrors placed at eye level so you can primp on the toilet. If you find yourself in the bathroom just after lunch time, be prepared to wait for a sink because there will probably be lots of people brushing their teeth. It isn’t uncommon to have a toothbrush and toothpaste that is strictly for your office. 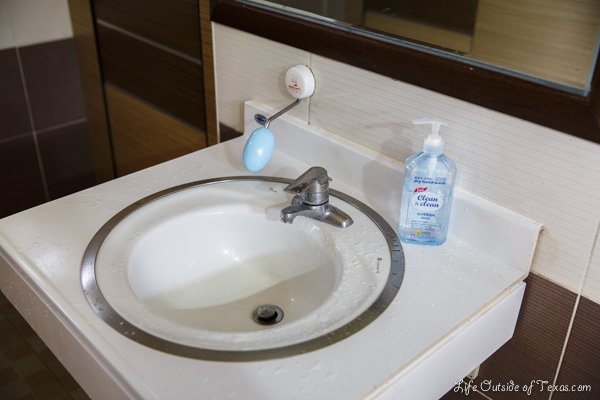 Along the same lines, one of my favorite things that can sometimes be found in Korean bathrooms is a mouthwash dispenser! I’ve really only seen them in department stores and sometimes restaurants, but I think it’s a great idea! 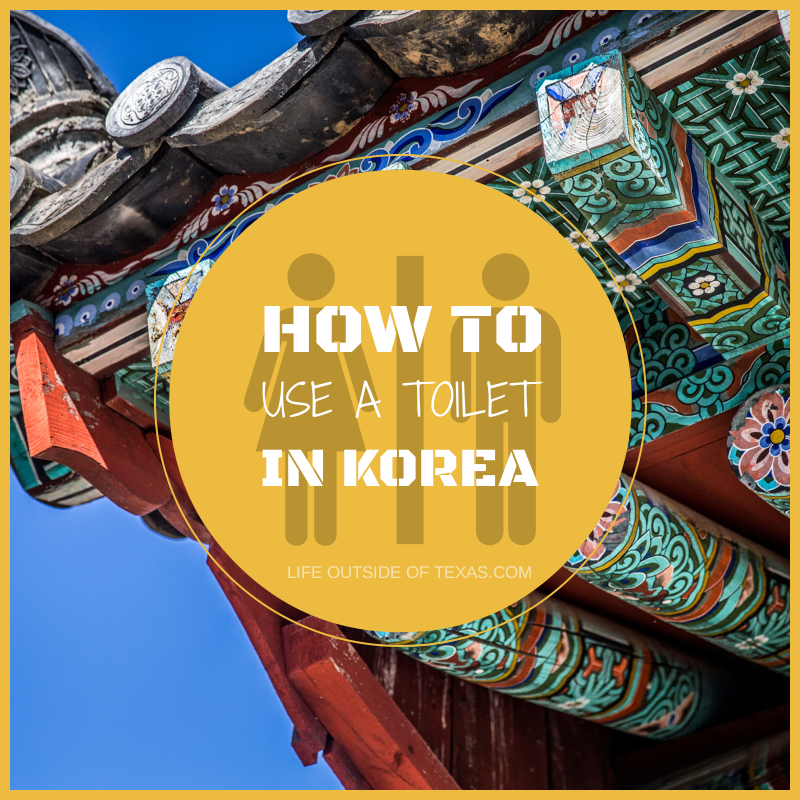 There you have it… everything you need to know about how to properly use a toilet in Korea (and probably more). Have you experienced bathrooms like these before (and where)? If not, which of these things would be the hardest for you to get used to? Did you know Life Outside of Texas is also on Facebook? Please click here and like our page! This entry was posted in About Korea, Culture and tagged asian squat toilets, asian toilets, bathroom in korean, bidet, expat, flushing toilet paper, korea travel advice, Korean culture, korean culture facts, korean phrases, korean toilets, squat toilet, squat toilets, squatty potty, squatty toilet, travel, what is a squatty potty, where is the bathroom in korean by Meagan & Dave | HappilyEverExpat.com. Bookmark the permalink. Haha this is a great post. I haven’t been to Korea but I was horrified the first time I had to use a squat toilet in Taiwan (mainly because it was in disgusting condition but still). All my Korean friends have a bidet in their house and I get really confused pressing all the buttons since it’s all in Korean lol. Didn’t know about the soap on the stick thing though! Yeah, the soap on a stick was really hard to get used to seeing. And I agree, not all squat toilets are created equal! Thanks for reading! Some great tips here. I love the advice about the bidet, that did place some very funny images in my head. As for squatting, I guess many Westerners hate the idea, we’ve been spoiled with modern sanitation. I guess a few hundred years ago it would be natural to us too but we’ve lost that skill. I once went to an English teacher’s training at the office of education and found a toilet stall with water sprayed everywhere. I assumed that it had to have been another foreigner that did it and I looked around all day trying to spot the victim. I think they must have been too embarrassed to stay. Can’t say I blame them! Thanks, I’ve actually been collecting all of the photos for a while now. Even though it’s not uncommon to see a lot of this stuff, I don’t always think to take a photo! What a funny and informative post. We’re moving to Seoul in June and while I’ve encountered a few interesting toilet/toilette situations in Europe, this gave me a chuckle. Thanks for the squat toilet and TP paper advice! It’s really not that bad, especially since you’ll be living in Seoul. The bigger the city, the more western options you have. Keep me posted on how you’re liking Seoul once you get settled. I’ll be following along on your blog. I’ll keep you posted as we get there and get settled in. Korean toilets aren’t bad at all compared to other places in Asia. 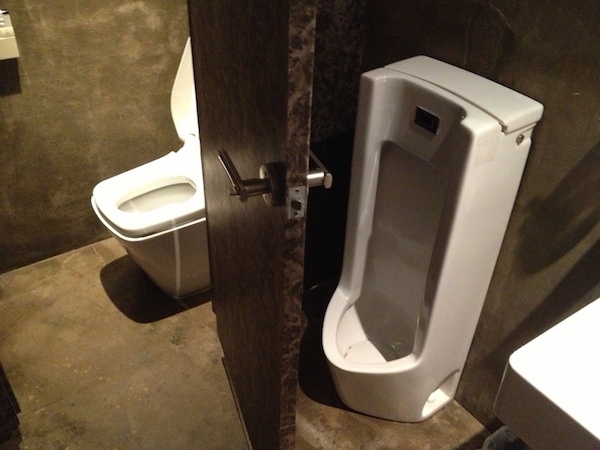 I have to admit that I was a bit traumatized by the toilets I used in Malaysia. Not all bathrooms have separate primping areas, but I don’t think it’s uncommon. I’ve only seen mouthwash dispensers in department stores and very few restaurants though. I tend to think public restrooms are cleaner in Korea than in America. The only problem is when the trash needs to be emptied. Also, some bathrooms smell like smoke here because women would prefer smoking in the bathroom than in public. What a genuinely useful, brilliant post! Love that soap on a stick! Thanks, Sarah! I guess it keeps the soap from getting lost. I still prefer the liquid soap though. Thanks for reading! We have a mouthwash dispenser in our offices in NY and I love it! Maybe soap on a stick will come next! Such a cool post! I’m familiar with squat toilets, even the funky hybrid ones, but soap on a stick? What the hell! Thanks for sharing! Yeah, I agree… it really threw me for a loop! It’s even more interesting when you see several of them in a row. Really thorough! Enjoyed the post, and it’ll be great info. to know for newcomers to Korea. Well … now I have to visit Korea! Who knew going to the loo could be such a cultural experience!!!! haha For sure! It’s funny how the things you take for granted change when you travel. Naturally, I prefer the Western style, but my squatting muscles have developed to the point where I can perform an extended squat purge and not feel like I’m going to keel over backwards. The men’s room at my hagwon only has a single squat toilet and most of the places I visited in Mongolia had the same, so I’ve gotten lots of practice. Recently, however, I had an ’emergency’ and tried to use the men’s room, only to find it occupied. Desperate, I knocked on the door to the women’s bathroom and, when no one answered, I went in and locked the door behind me. Inside was not one, but TWO Western toilets. I’ve been getting robbed this whole time! That is hilarious, Nathan! I can’t believe the girls get a western toilet and you only have one squat toilet. Doesn’t seem very fair. Must not be many male teachers at your school? Oh wow so the women only have western toilets. Maybe one of them are secretly wishing they could squat more? Many Malaysian public toilets don’t have soap at all, so I’m thinking soap on a stick is better than that. Given a choice between Western and squat, I choose Western. I’ve only seen the bidet type toilets in Japan and didn’t realize that S. Korea had them, too. They’re fun! That mouthwash dispenser is a total surprise to me. I really like that amenity. It’s a great amenity. Maybe they will grow in popularity in other parts of the world too! Bidets are nice and I don’t think they’re that expensive here. We have one in our apartment, but we only use it for the seat warmer in the winter because our bathroom gets incredibly cold! The squatters in Korea always blow my mind! Old men and women just doing that low down squat! It’s nuts. But I must say, those toilets in the ground really don’t work for me haha. I’m pretty envious of their amazing squat skills. I’m not envious about that hunch it puts in so many older people’s backs though! Looks so painful. I can relate. I definitely have that moment of awkwardness when visiting home and I’m not sure which country’s rules to abide by! I remember using my first squat toilet in 2007. It was a rainy night in Jakarta. Oy!!!! They still aren’t my favorite, mainly for balance reasons. I also don’t know why the electric seats are so popular in Asia. Although, when I was doing a few hotel reviews in winter, they were certainly welcome. Such vivid memories of your first squat toilet, eh? 😉 Our bidet never gets turned on unless it’s winter and then I use the seat warmer. I have gotten so used to so many things in Korea like squat toilets that i forgot how shocking simole things like going to the bathroom can be especially the buttons on the bidets. I think I used it once. But I still cant bring myself to putting the used toilet paper in the bin. It FEELS so wrong. It is probably the one thing i have not adjusted to and probably never will. And i just learned you cannot put your used floss in there either. How small are these pipes?! I flush toilet paper at my house, but I usually toss it in public (if I remember). I’ve never thrown floss down the toilet. I didn’t know it was flushable? Floss shouldn’t be flushed anywhere, including the U.S. It gets tangled in the mechanisms at the plants. That’s according to our city’s public works dept. I’m glad I normally have a western option. Great rundown of choices for foreigners because I feel like that’s one thing that we don’t think about before coming here. Great poost! Thanks! There are definitely a lot of things I had to find out the hard way in Korea. My school had one sqauter toilet and a normal one. A couple weeks ago i walked into the bathroom to find they’d replaced the normal toilet with a second sqauter. No idea why. Sigh. Ouch Alex, I feel for you. Haha! This is such a great post! I try to avoid to avoid the squatty potties when I can. However, I’ve become convinced that Korean women wear skirts so often because they are easier to deal with in that situation! I really LOVE the heated seat toilets here in Korea. Its something I am very much still not used to, but its fabulous in winter! The buttons took me a while to figure out but now I love abusing my school’s teacher toilets (muhaha). As for the squat toilets, sometimes I prefer them to sit toilets in public areas because I find them to be cleaner? Although I DESPISE using them when I’m wearing pants! I have never seen dental floss in a bathroom, that is so fascinating. The soap on a stick though, I just can’t bring myself to share a bar of soap in a public bathroom. I do love that public toilets are EVERYWHERE in Korea and they’re usually very clean. why doesn’t america use bidets? they are amaaaazing and make you feel so clean! i will not, however, miss the soap on a stick. feels like i’m giving an HJ every time i wash my hands. As someone who lived in Singapore i hated Korean toilets during my trip. I don’t give a flying crap about how high tech they can make them when they can’t even handle the dump of a tiny Asian guy, because the flush pressure is too low and the hole is simply too small, much less the dump of big sized Caucasians. I can only imagine public ones are even worse. That’s a good question! I’m sure it varies by university. I have barely spent any time in a university in Korea, but I don’t recall any bidets while I was there. Since this is the case can you help me and list me things that I will need to take with me to Korea ? Korea has just about anything you need. Where will you be located? How long will you be there? I always liked to bring my favorite snacks from my home country and my favorite products (toothpaste, etc), but really you don’t need any of that. Even clothes and shoes (for anyone bigger than “Asian size” are easier to find now, but it’s a good idea to come prepared. I will be attending Yonsei university ” God willing ” but this is the first time for me being in Korea so I am a bit nervous specially about the toilets after I heard that they use toilet papers only no water bidets ” with all my respect ” but I hope everything goes in a good way . Even if they don’t have bidets, I’m sure you’ll get used to toilet paper. And plenty of places do have bidets. I hope you enjoy Korea! When I visited South Korea, trying to find the flush button I’ve pressed the Help button. Pretty embarrassing but good if you remain stuck in one!